We understand that entering a rehabilitation or skilled nursing facility can be a difficult and stressful time. It can also come about suddenly and often times present difficulty in understanding what medicare and other insurances cover. Knowing the financial obligations this type of care entails is important and understanding what the resident is entitled to under their individual insurance policy(ies) can help alleviate some of this stress. Our Business Office and Admission staff will work closely with your insurance company or payers so that the resident fully understands how the financial aspect of their stay with us will be covered. 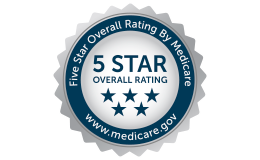 We accept both Medicare Part A and B and have contracts with numerous managed care organizations. We will also help to determine what any secondary insurances will cover and what those policy benefit/restrictions might entail.